Three Stooges karatasi za kupamba ukuta. Here are some Stooge karatasi za kupamba ukuta for your desktop!. HD Wallpaper and background images in the Three Stooges club tagged: wallpaper three stooges moe howard larry fine curly howard. Here are some Stooge karatasi za kupamba ukuta for your desktop! 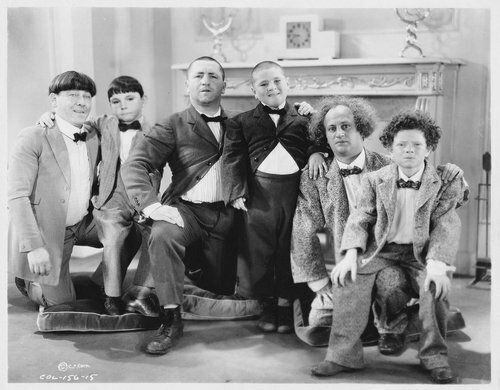 This Three Stooges photo contains suti biashara, biashara suti, wamevaa vizuri mtu, suti, suruali nyayo, pantsuit, mtu wamevaa vizuri, and suti ya suruali. There might also be outerwear, overclothes, chumba cha kuchorea, chumba kuchora, ishara, bango, maandishi, ubao, matini, and ubao wa chokaa. cute! but what was this taken for?